Permission has been granted for 3,500 new homes on Dublin's Poolbeg peninsula with 25% earmarked for social and affordable housing. Local representatives have welcomed the decision by An Bord Pleanála. 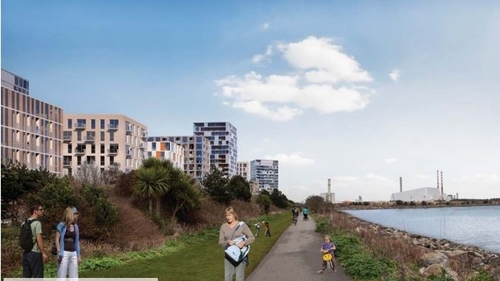 The development know as Poolbeg West is planned for the old Irish Glass Bottle site and a smaller plot known as the Fabriza site, which together comprise 15 hectares. Receivers for the original consortium that owned the land, Becbay, had opposed proposals by Dublin City councillors to increase the provision for social housing above the legal requirement of 10%. The decision which will mean 875 new social and affordable homes has been welcomed by Labour Senator Kevin Humphreys. "This is a major step forward which will give local people the opportunity to stay living in their own communities" he said. Residents in Ringsend and Irishtown, who say they have been priced out of the local housing market because of the presence of Google, Facebook and other IT companies in nearby Grand Canal Dock, had campaigned for the increased affordable housing. The Department of Housing will have to reach an agreement with the receivers Deloitte on funding the extra 15% social and affordable housing. The application was made as a Strategic Development Zone (SDZ), which involves a detailed masterplan for the whole site and any individual planning application that complies with the plan can expect to quickly get planning permission. Last year the planning board asked for more information on what will be a new "city quarter" and details of recreational and social facilities for the 16,000 people who will be living or working there. In its decision the board said there should be detailed landscape plans for a Village Green and Coastal Park drawn up within one year of publication of the planning scheme. It specifies that there will be a 27m-wide central boulevard incorporating cycle lanes, wide footpaths and a tree-lined landscape. The board ruled that to encourage sustainable communities, build-to-rent apartments would be limited to a maximum of 150 units in each of the four main blocks of the development. The decision also provides for the creation of a minimum of 40 artists studios in the development and for a district hearing scheme using energy from the nearby Poolbeg incinerator. Dublin City Council owns around one quarter of the Irish Glass Bottle site as the original Becbay consortium involved the former Dublin Docklands Development Authority. Other members of the consortium were developer Bernard McNamara and financier Derek Quinlan. The land was bought for €412m by Becbay in 2006 but valued at around €30m after the property crash. NAMA, which has control over large elements of the area, said it welcomes the announcement and has been working intensively on the preparation of a commercially driven delivery strategy for the site. It said it would review the detailed terms of ABP’s decision and would examine how best to implement the delivery strategy with a view to ensuring housing delivery as soon as practicable.